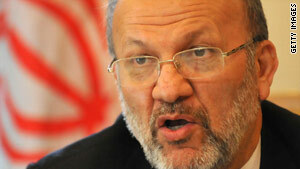 Foreign Minister Manouchehr Mottaki said Iran would not send its uranium abroad for medical research. (CNN) -- United Nations nuclear inspectors Thursday visited an Iranian nuclear plant that was secret until September, the International Atomic Energy Agency told CNN. It is the second time IAEA inspectors have visited the plant near the city of Qom, which Iran shocked the world by revealing two months ago. The visit comes a day after Iran's foreign minister rejected a key part of a deal designed to reduce international fears Iran wants to build nuclear weapons. Foreign Minister Manouchehr Mottaki said Iran will not send its partially enriched uranium abroad to be turned into material for medical research, but added than Tehran might allow its nuclear material to be reprocessed inside Iran, the semiofficial ISNA news agency reported. The deal hammered out last month with the help of the IAEA aimed to reduce the amount of raw material Iran has to build a nuclear bomb. The IAEA -- the U.N.'s nuclear watchdog agency -- said Wednesday it could not confirm or deny that Iran had rejected any part of the proposal. President Obama warned Iran Thursday there would be "consequences" if it did not accept the plan. "We have begun discussions with international partners about the importance of having consequences," Obama said on a trip to Seoul, South Korea. "Our expectation is that over the next several weeks, we will be developing a package of potential steps we could take that will indicate our seriousness to Iran. I continue to hold out the prospect that they may decide to walk through this door. I hope they do." Major world powers will meet Friday to discuss Iran's nuclear program, European Union foreign policy chief Javier Solana's office told CNN Thursday. The United States, Russia, China, Germany, France and the United Kingdom meet regularly to try to map out a way forward on Tehran's controversial program. Iran insists it only intends to produce nuclear energy for peaceful purposes, including civilian electricity and medical research. IAEA inspectors first visited the newly revealed facility at Fordow last month, according to an IAEA report published Monday. During a meeting in Tehran, Iranian officials told the inspectors that construction of the site had begun during late 2007, the report said, and it would not be operational until 2011. However, the IAEA inspectors told Iran "it had acquired commercially available satellite imagery of the site indicating that there had been construction at the site between 2002 and 2004, and that construction activities were resumed in 2006 and had continued to date," the report said. IAEA member states also allege that design work on the facility, the Fordow Fuel Enrichment Plant, began in 2006, the report said. Iranian officials told inspectors that the nation has no other undisclosed nuclear facilities either under construction or in operation, the report said, and promised that any future facilities would be disclosed. Iran remains bound by the terms of a 2003 agreement under which it must provide information to the IAEA regarding nuclear facilities as soon as the decision to build is made or construction is authorized. CNN's Ashleigh Nghiem contributed to this report.